Billed by the New York Times to be “the dating app for would-be power couples,” The League is paving the way for a new approach to dating. In today’s dating climate, sorting through the noise can be both tiring and frustrating. For The League, a focus on privacy and preferences is the top priority–and hugely desired by its users. 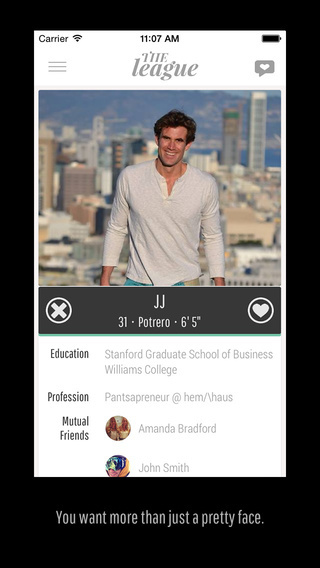 The League’s users provide information via Facebook and LinkedIn, allowing the app to protect them from their immediate personal and social networks while simultaneously identifying great potential matches who are “in their league.” Each day, users are shown only five potential matches–but each chosen from the more highly selective community that constitutes The League’s membership. To offer the best in privacy and in truly suitable matches, The League needed a robust mobile backend solution to power its heavy traffic. Having made a splash in Forbes, The Tonight Show, and more, The League was faced with a huge influx of interest, and Parse was key to fielding that interest smoothly. Parse is highly reliable, available, and predictable. It allows query building in our native mobile languages. We’ve been able to modify our database schema on the fly…and we never had to take the app offline or perform a migration. While some apps struggle for months or years to build a chat interface for users, with Parse we have spent less than two weeks on it during our four months of building. It is incredibly easy to use, even for first-time developers. When prototyping and testing, the ability to effortlessly edit the cloud database in real time via the browser is a godsend. The League is available for download now on the App Store.